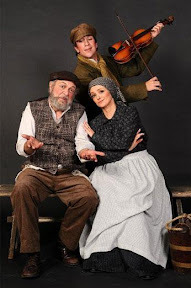 I went to the matinee showing of Fiddler on the Roof at the Artscape yesterday. It was practically sold out, great to see Cape Town being so supportive its arts. I also chatted to the lead ballerina for the recent Swan Lake at Artscape and she said every night of Swan Lake was sold out. Maybe it has something to do with the recent Oscar winning movie Black Swan, as it’s about ballet and Swan Lake. But whatever the reason, good support of the arts will only lead to better and better shows. Fiddler on the Roof was an excellent show. It wasn’t at the level of Mamma Mia, but I certainly enjoyed it more than Cats! The sets were done well and I love the way they did the ending, it looked so real. In terms of the acting, a few hiccups with the singing and accents tended to wax and wane, but generally it was good. Especially considering it is presented by an amateur dramatic association (CT Gillbert & Sullivan Society). If you’re unfamiliar with this musical, which originally opened on Broadway in 1964, you can find more information at the Wikipedia entry. I would definitely recommend the show. It’s a great one to take the kids to, and the tickets are not too pricey. Tickets range from R90 to R200 depending on the day of the show and the selected seats. Tickets can be purchased from Computicket.